We are pleased to be expanding our range of throne chair hire today here at Event Hire UK with the addition of our white lion thrones which are perfect for Asian & Indian weddings, for instance, along with a wealth of other special occasions and events. Especially at weddings, where it’s the bride and groom’s big day, they want to feel special, and top quality wedding furniture hire such as these white thrones certainly helps to achieve this during the wedding reception or party. These thrones really do look stunning at the top table, where the bride and groom can sit in both comfort and style during the festivities. These wedding thrones are intricate and ornate in design and, as you would expect, they are extremely comfortable due to the fact that they are cushioned on both the seat and the back with faux white leather upholstery. The look is complete with large crystal inserted into the leather back. For all your throne hire and chair hire requirements, spend some time online at Event Hire UK where you will find everything you need under one roof. From our network of sales and distribution centres across the country, we offer a competitive delivery and collection service which is very much valued by our clients for bulkier items such as throne hire, for example. 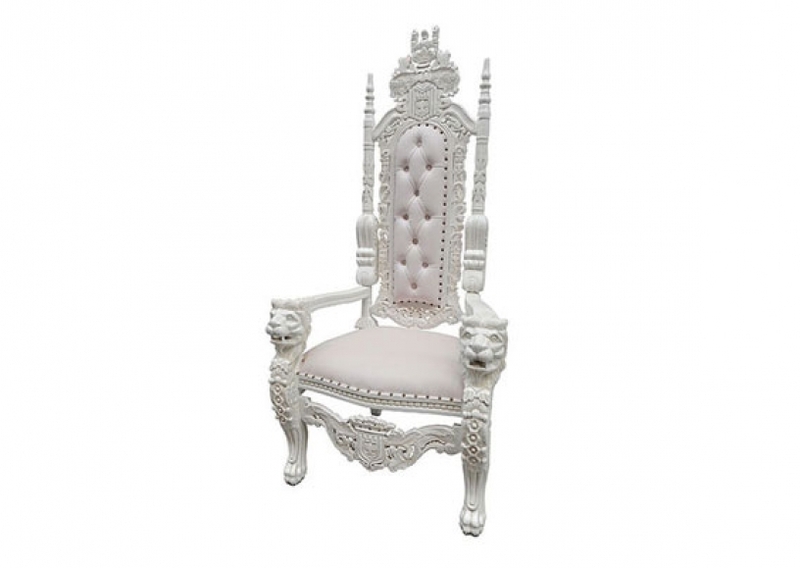 Find our new white lion throne chairs in our throne hire section online which is in our furniture hire range. Contact us today to discuss your upcoming wedding event requirements.